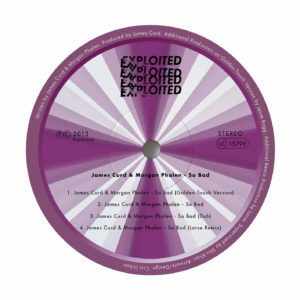 James is back on Exploited. Including a remix by hotly tipped german producer Larse. James Curd has worked with everyone from Kaskade to PNAU to Lawrence Welk (!) to enlisting his services for The Incredibles soundtrack, all without making it seem like a stretch. His projects like Greenskeepers have defied easy description and have garnered love from John Peel. He’s written one of the 00s most curious cult hits in “Lotion,” a groovy guitar jam set to Buffalo Bill’s lines from Silence of the Lambs, and the group’s foray into house (both organic and inorganic sounds). He’s respected in house and electronic circles, but he still loves the guitar and the classic pop/rock of American radio, though he now operates out of Australia. While in Los Angeles to music supervise the upcoming film Crush, James met singer Morgan Phalen. You may recognize Morgan’s vocals from the psychy second LP by Justice, “Audio Video Disco” or heard his band Diamond Nights. Morgan and James had studio sessions in both in LA and Australia. They traded ideas back and forth from LA to Australia inbetween trips to build an massive catalog of music. They have new music coming out together as a collaboration as well as a full band project called “Favored Nations” with Sid Who? from “The Swiss”.